Not only is our Roy collection but is luxuriously comfortable to sit in, but it was built to last. Sit on top of ultra-plush feather down topped pocket coils seats, wrapped in a Gunmetal pull up bonded leather match. 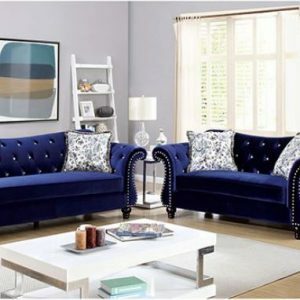 Adorned with button tufting and rolled arms and back, this collection is also offers attached seat and back cushions. Folded seams without stitches and solid wood legs and frame give each Piece lasting durability.